In 1992 Mr. Pratt won the Naumburg International Piano Competition and two years later was awarded an Avery Fisher Career Grant. Since then, he has played numerous recitals throughout the US including performances at Lincoln Center, the Kennedy Center, Dorothy Chandler Pavilion in Los Angeles, Chicago’s Orchestra Hall and the NJ Performing Arts Center. His many orchestral performances include appearances with the New York Philharmonic, Minnesota Orchestra and the Pittsburgh, Atlanta, Baltimore, St. Louis, National, Detroit and New Jersey symphonies among many others. Summer festival engagements include appearances at Ravinia, Blossom, Wolftrap, Caramoor and Aspen and the Hollywood Bowl. Internationally, Mr. Pratt has toured Japan four times and performed in Germany, Italy, Switzerland, Poland, Israel, Columbia and South Africa. Recent and upcoming appearances include recital engagements in Baltimore, La Jolla, Los Angeles, Pittsburgh, Ravinia, Lewes, Delaware, Duke University and at Carnegie Hall for the Naumburg Foundation; as well as appearances with the orchestras of Cincinnati, Indianapolis, North Carolina, Utah, Richmond, Grand Rapids, Memphis, Fresno, Winston-Salem, New Mexico, Rockford, IL and Springfield, OH. He also serves on the faculty of the Eastern Music Festival in Greensboro, North Carolina where he coaches chamber music, teaches individual pianists and performs chamber music and concertos with the festival orchestra. Also an experienced conductor, Mr. Pratt has conducted programs with the Toledo, New Mexico, Vancouver WA, Winston-Salem, Santa Fe and Prince George County symphonies, the Northwest Sinfonietta, the Concertante di Chicago and several orchestras in Japan. 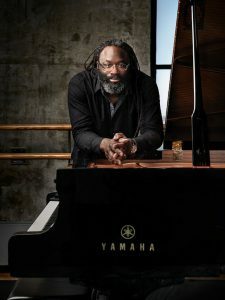 A great favorite on college and university performing arts series and a strong advocate of music education, Awadagin Pratt participates in numerous residency and outreach activities wherever he appears; these activities may include master classes, children’s recitals, play/talk demonstrations and question/answer sessions for students of all ages. He is also frequently invited to participate on international competition juries, such as the Rubinstein International Piano Master Competition in Israel, the Cleveland International Piano Competition, Minnesota e-Competition, the Unisa International Piano Competition in International Competition for Young Pianists in Memory of Vladimir Horowitz in the Ukraine. In November 2009, Mr. Pratt was one of four artists selected to perform at a classical music event at the White House that included student workshops hosted by the First Lady, Michelle Obama, and performing in concert for guests including President Obama. He has performed two other times at the White House, both at the invitation of President and Mrs. Clinton. Mr. Pratt is currently a Professor of Piano at the College-Conservatory of Music at the University of Cincinnati. He also served as the Artistic Director of the World Piano Competition in Cincinnati and is currently the Artistic Director of the Art of the Piano Festival at CCM.